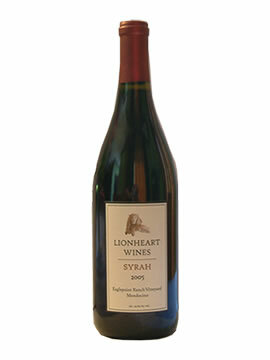 Lionheart Wines was started with the philosophy of producing excellent premium affordable boutique wines to be shared with friends and family over great meals. Life is too short to drink anything less than good wine! Our wines are made to be served with food. A good wine and a good meal by themselves are just that good. However, when the proper food wine pairing happens, a good wine and a good meal become outstanding and something you will remember for many years to come. We want to share our passion for food and wine to help you create your own amazing memories. Great wine starts in the vineyard....only great grapes can make great wine. So, we are sourcing our fruit from some of the best low-yield farmed vineyards throughout California based on viticultural practices, clonal selection and desired fruit characteristics. We are looking to produce the best possible wine through use of top quality oak barrels (when appropriate), top quality fruit, extended aging and blending to reach the product Leon approves of. We will always be looking for excellent fruit sources and trying new blends to produce the best wine for you. We have a fantastic selection of perfectly cellared wines that are drinking beautifully!